Over the next three months we will be adding our research and films created by Worthing college students to this site. 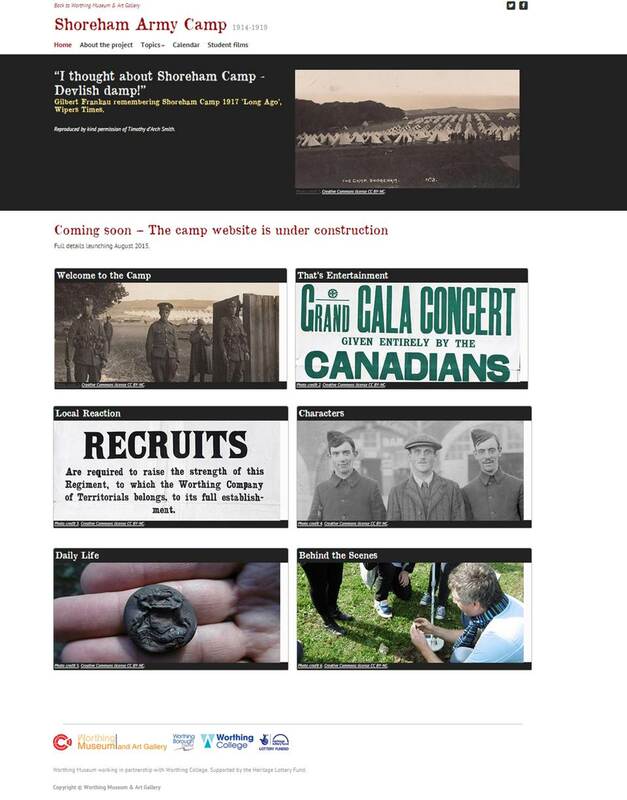 Each time a section is complete look out for an announcement here on our blog. On 26th January we took a trip to the Lightbox, Woking to discover the hidden story of a WW1 horse shoe. Back in Autumn 2014 a local landowner offered their field up on the downs above Shoreham to the project for a metal detecting search. Students from Worthing College, under the supervision of Archaeology South-East and Sussex Past archaeologists, found WW1 ammunition, nails and buttons. The grandson of the landowner found an old horse shoe. Metal toy gun carriage with 5 horses made by W.Britains c1914. Oil painting of a farm scene by unknown artist, c1880s. Detail of British Army farrier on roadside in France from ‘War Illustrated’ magazine 12 Dec 1914. Postcard of 60 pounder gun c1915. Edited by exhibitions curator Hamish MacGillivray as part of occasional scrapbook style slideshow series about some of the stories from Worthing Museum. 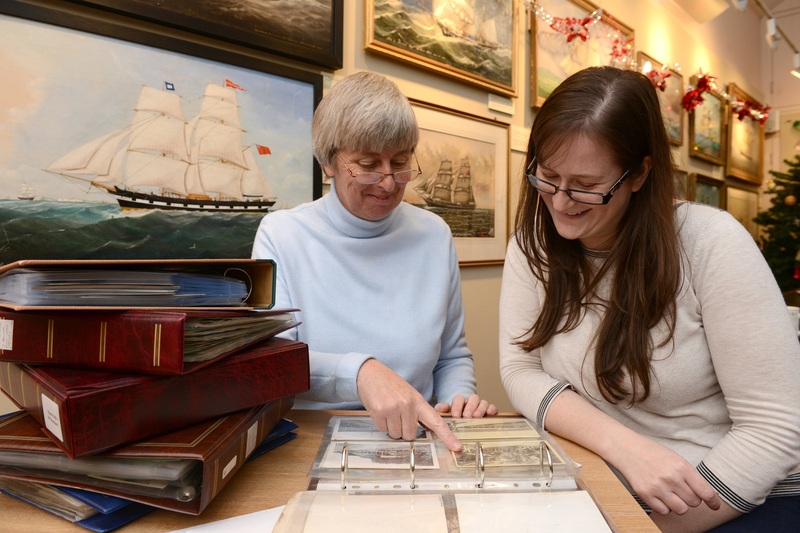 Thanks to Worthing Museum volunteers for photographs and the Lightbox gallery and museum for their advice. 17th Dec 2014: At the end of last year a group of our older volunteers took a day trip to the Marlipins Museum in Shoreham. The purpose of the trip was to search through the photograph collections held at the museum that feature Shoreham. 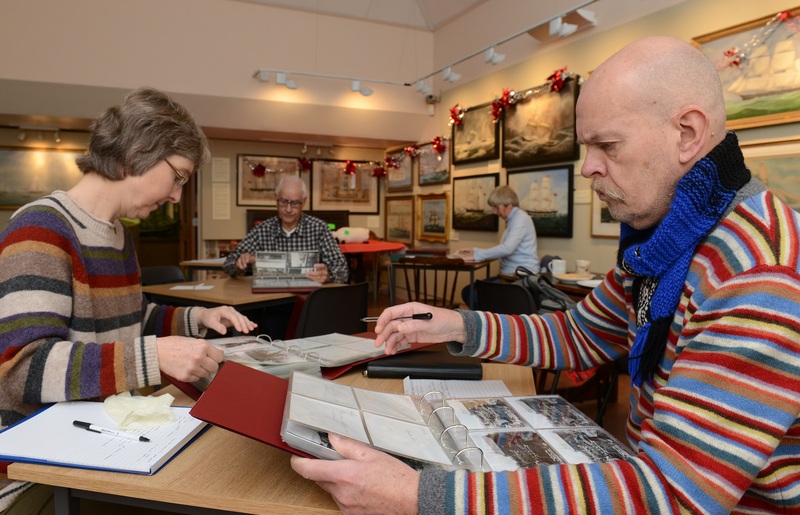 At the Museum our volunteers looked through dozens of folders picking out the pictures that featured Shoreham Army Camp in WW1. They also looked further for ones that showed the soldiers in the town and interacting with the locals. 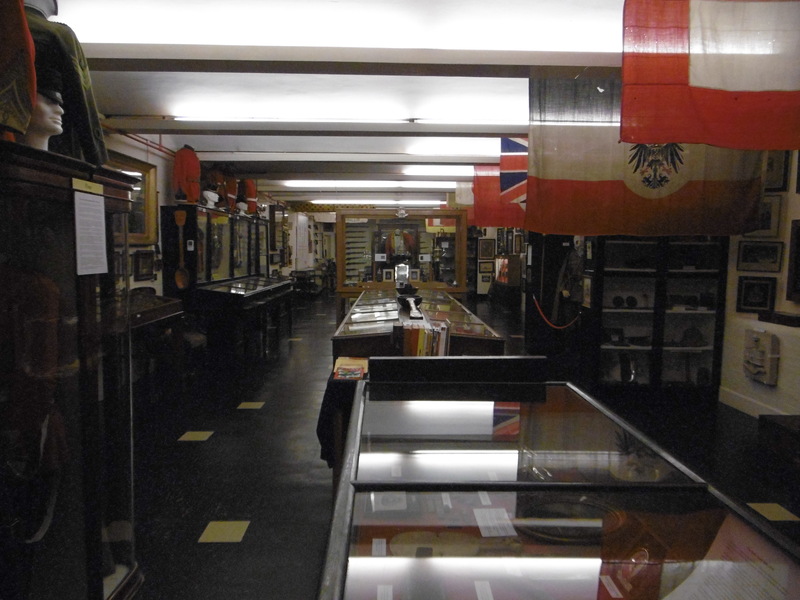 The collections gave us insights into the camp, its soldiers and their daily activities which we will reveal in our exhibition coming to Worthing Museum on the 25th of April 2015. It will stay in the Museum for four weeks then move to Worthing College.The exhibition will also be visiting Marlipins Museum itself in September 2015. 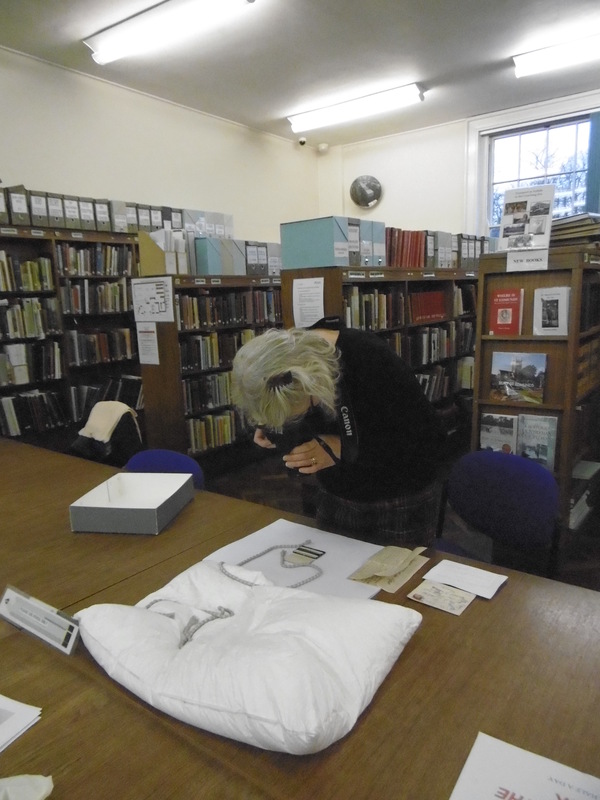 Many thanks to Emma O’Connor, Museum Officer, and the Sussex Archaeological Society for sharing their collections with us. On Friday 5th December Project Coordinator Gail Mackintosh and a volunteer photographer set off for Bury St Edmunds for the weekend. The aim of the trip was to photograph material to illustrate the life of Edmund Goodchild. The above photograph of Edmund Goodchild and further information, including typed up versions of Edmund and his brothers’ letters, are provided by http://goodchilds.org/, courtesy of Henry Finch a nephew of the brothers. Edmund Goodchild (Ned) and two of his three brothers volunteered for Kitchener’s New Army in 1914. They all wrote hundreds of letters about their time in the Suffolk Regiment both in training and on the Front Line to their mother in Suffolk. Ned was the oldest brother and was sent to Shoreham Army Camp along with younger brother Arthur in September 1914 to be trained. His letters detail his experiences in the camp and offer invaluable insights for our project. We visited the Suffolk Record Office at Bury St Edmunds to see the original letters and connect with the personal touches – for example when he scribbled ‘Don’t worry yourself, mother’ in the corner of a letter. Thank you to the Record Office for helping us with our research. 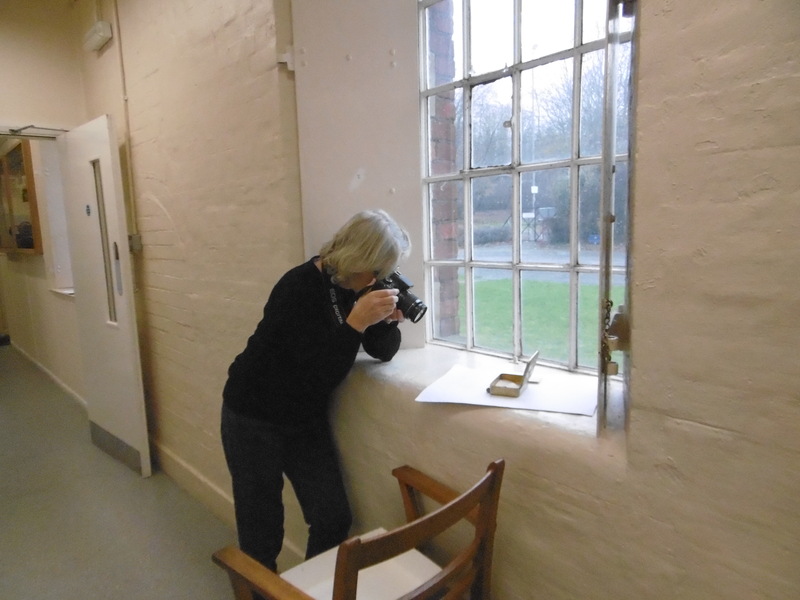 Our volunteer photographer taking pictures of the original letters at Suffolk Record Office. Thanks to the Suffolk Regiment Museum (www.suffolkregimentmuseum.co.uk) we were also able to handle and photograph some of Ned’s personal effects. Volunteer photographer taking pictures at the Suffolk Regiment Museum of Ned’s personal effects. Ned sadly did not make it back home from the front line dying in action on 19th December 99 years ago. 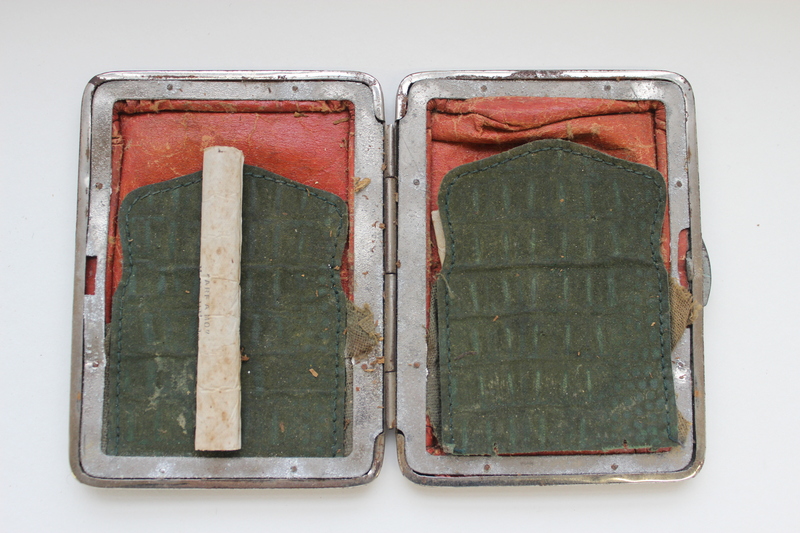 His personal effects were sent home to his mother and his family gave them to the Regiment Museum. Included were his medals, a flask and a cigarette case. We will be featuring more about Ned and his brothers in our exhibition next year. 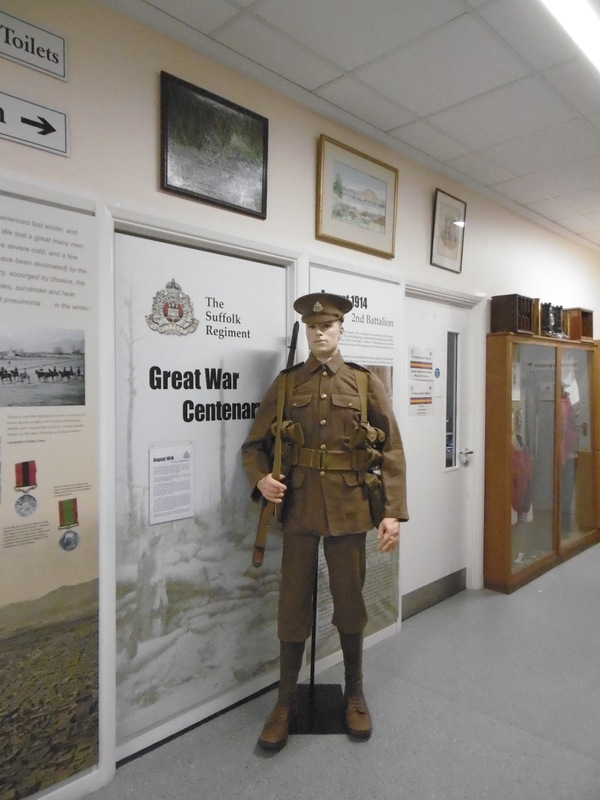 Many thanks in particular to Gwyn Thomas (Suffolk Regiment Museum Curator) and the Suffolk Regiment Museum volunteers who made out trip enjoyable and passed on helpful insights about Ned and the history of the Suffolk Regiment. Thank you also to Henry Finch for giving us permission to reproduce images and excerpts from the letters. A collaboration with Worthing Museum, Worthing College and other partners.